There is some quality to the Nels Cline Trio's Silencer that keeps making me think of the first album by the jazz-rock trio Gateway. Cline's guitar here is often a clean and clear fluid mix of single note runs and well placed double stops that echoes Abercrombie's work decades earlier. Likewise, Cline dirties up his sound but often never quite gets into full on distortion when the playing intensifies. Though released nearly 20 years apart, both albums drew from rock and jazz liberally, creating seemless blends both of thier time and timeless. 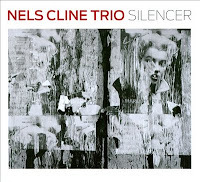 Enja's rerelease of this 1993 recording is a nice addition to Cline's currently available recordings. In the group at this time was Michael Preussner on drums and Mark London Sims on electric bass. A power trio when they get cooking, this collection is an excellent mix of melodicism and above par musicianship juxtaposed with great swaths of sound. Right from the start on Las Vegas Tango, Cline's guitar shimmers brightly, spinning lines over the solid jazz oriented rhythm section. Sharp, slightly moody solos follow the slow burning head, creating palpable atmosphere. In fact, the overall vibe of the album is well described by Cline himself on his web site. He writes "The first Trio recording - a bit low-key and reverb-y, but in spite of my insistence on harmonizer, a lot of this still sounds good." He is somewhat self-effacing. All of it sounds exceedingly good and there are a good number uptempo passages and songs mixed in with the quieter moments. What is kind of neat in hearing earlier work by an artist whose recent work you are familiar with is picking out the seeds of ideas and approaches that are built upon and refined as the years pass. Within this recording's ones and zeros you can hear the great cathartic builds and releases, arpeggiated melodies and abandon that makes Cline's music so compelling. The penultimate, nearly quarter hour, track 'Lapsing 1&2' has it all. Starting with an austere and captivating chordal movement, the tune segues effortlessly into an extended distorted soundscape and finally into one of those reverberant arpeggiated cathedrals of sound Cline creates so well. 'Silencer' is currently in heavy rotation just about everywhere I listen to music, which is just about everywhere I go, which is something I am particularly happy about.